This amazing salad recipe was passed on by a work colleague late last year and we have made it at least half a dozen times since. It is a great option if you are entertaining mid-week as you can prepare it the day before and it tastes even better on the second day. Mograbieh are large cous cous balls and are a popular Middle Eastern staple. They are not available in your average supermarket but are stocked at specialist shops such as those found in the Adelaide Central Markets or at Gaganis Brothers, Hindmarsh (and is surprisingly cheap at ~$3/kg). The vibrant mix of ingredients creates a unique blend of colours and flavours – sure to impress. 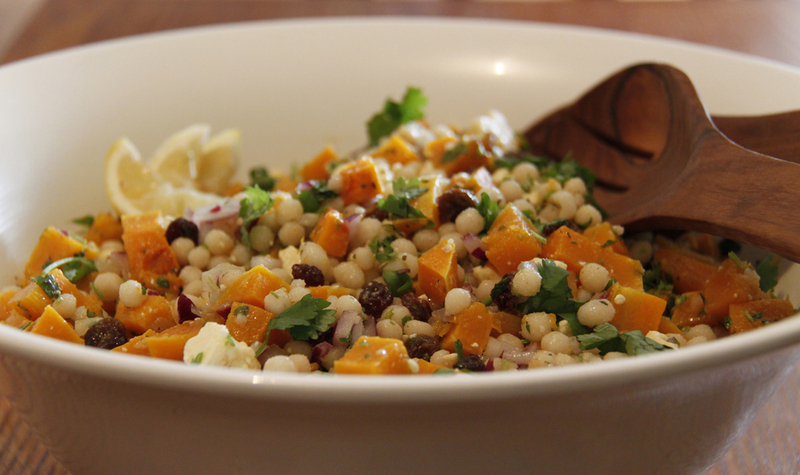 This entry was posted in Food and tagged Food, Mograbiah, Pumpkin, Salad, Sultanas. Bookmark the permalink.